Lot 19. 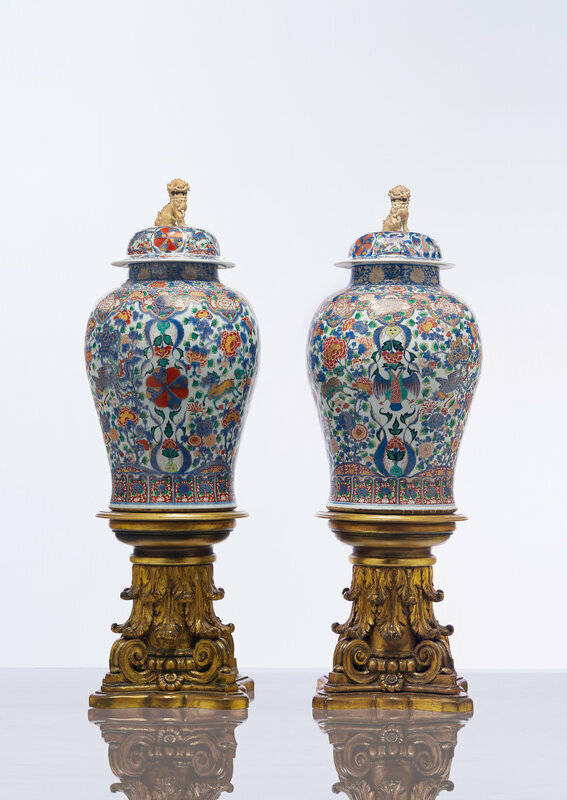 A massive pair of Mexican market verte-imari jars and covers, Kangxi period (1662-1722); 35 ½ in. (90.2 cm.) high. Estimate USD 80,000 - USD 120,000. Price realised USD 106,250. © Christie's Images Ltd 2019. Each exuberantly enameled on its swelling sides with a dense pattern of chrysanthemum and peony vine growing in a lattice-fenced garden, colorful qilin prancing amidst the foliage, all centered by a double-headed Hapsburg eagle on one side and a colorful floralmon on the other, these two motifs repeated on the domed cover beneath a biscuit lion knop, giltwood stands. Provenance: With Ralph M. Chait Galleries, New York. 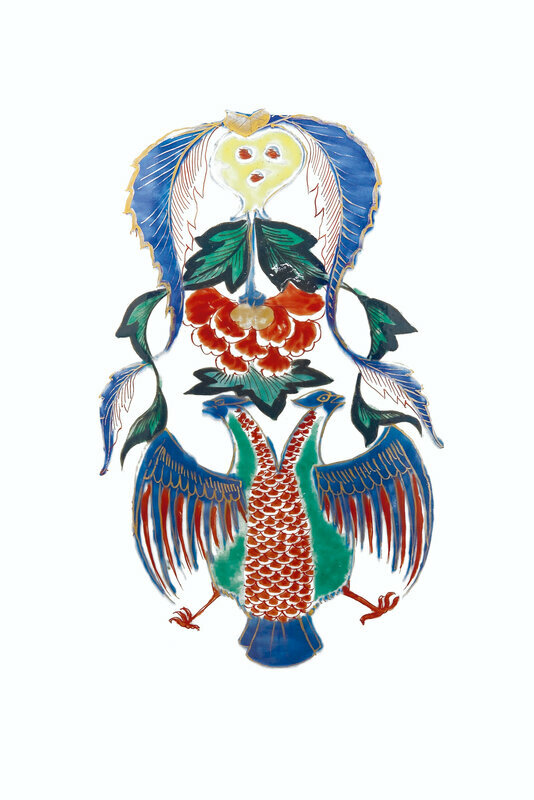 Note: The Hapsburg double-headed eagle was a potent symbol of Viceregal power in the New World, and appeared on Chinese embroidered textiles, Mexican silver and Puebla ceramics as well as on Chinese porcelains made for the Novohispanic market. By the time these jars were made Habsburg Spain had controlled Mexico for about two hundred years, and the New Spain territory extended far up the coast of California, across Arizona and New Mexico to Texas, and included Florida. 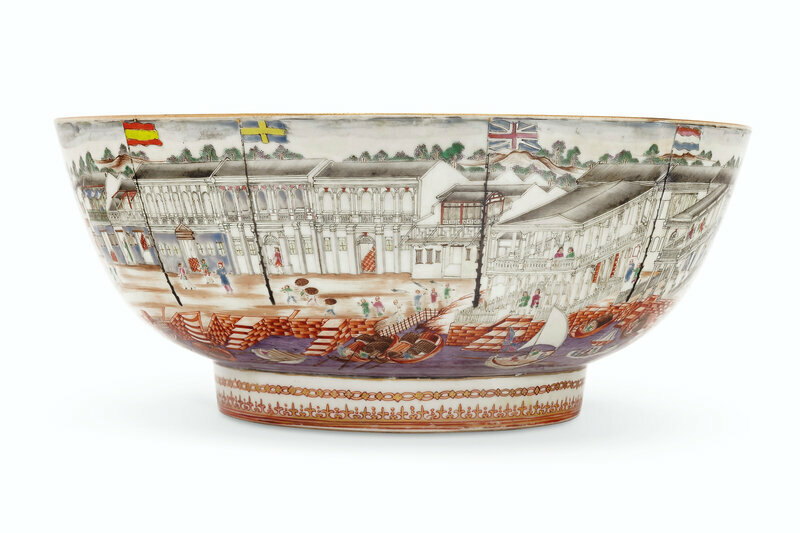 With a long-established outpost in Manila and a well-ensconced hierarchy in place in the New World, the Spanish were very well-positioned to commission important porcelains with their Imperial symbols, even if, at this relatively early date for Chinese export porcelain, those symbols are somewhat submerged in a wholly Chinese pattern. 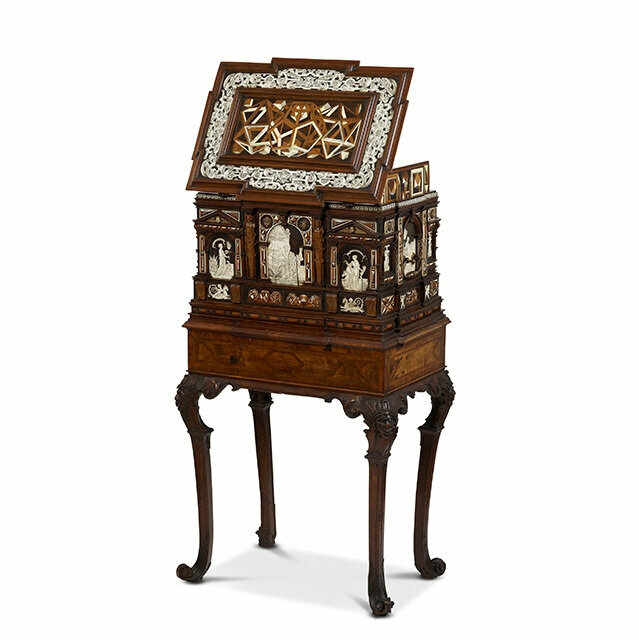 Compare a very similar, single jar and cover sold Christie's Paris, 14 December 2016, lot 83.